A family wedding is being celebrated, but only Johnny Benedetto, stepson to Don Claudione, is downcast. Unlike the other revelers, he wears black and keeps himself apart. The Stepfather asks him what has him so gloomy. Johnny Benedetto: I shall in all my best obey her. Don Claudione: Good. Because a man who doesn’t spend time with his family can never be a real man. Come here [pats his cheek] You look terrible. I want you to stay here, rest well, and a month from now this big shot in London’s gonna give you what you want. I’ll send you there with Rosencrantz and Guildenstern. Reliable men. Johnny Benedetto: Too late. They start rehearsing in a week. 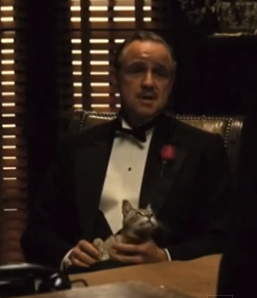 Don Claudione: [pats him on the back] I’m gonna make them an offer they can’t refuse. *Thanks to the LSH for the logo! “You sonofabitch, Do you know who I am? I made my bones when you were going out with cheerleaders.”.. Ahmm…. So true…. LOL nice reimagining of two pieces in one. Thanks Guylty 🙂 The LSH loved this one. Why is it that all men adore the Godfather?? Cos those mafia types are reeeeeeeal men…? My LSH has a similar thing going on with “Goodfellas”. At heart they all want to be Don Corleone..
Have fun this evening!! Anxious to hear your thoughts about the show as it stands now. Wonderful, Linnet. I’d love to see the production. I can’t imagine there would be a cast in the world who wouldn’t jump at the chance to be part of this adaptation. And this made me quite desperate to seek out a good showing of Rosencrantz and Guildenstern are Dead. Haven’t seen that in donkey’s years. It’s quite an experience–both the play itself and the surrounding hoopla.